Just because it is possible to integrate a smart device into an IoT system, it doesn't mean we should. With global Internet of Things (IoT) adoption showing no signs of slowing down, the foundations of Smart Homes and Cities are beginning to spring up around the world, starting in Singapore, Thailand and even Bristol - which recently overtook London as the UK’s leading Smart City. Historically, urban and domestic challenges from traffic congestion to the safety and security of homes and public buildings has been addressed by individual, siloed measures from disparate government departments. However, the advent of IoT has pushed the creation of fully integrated environments to the top of agendas. 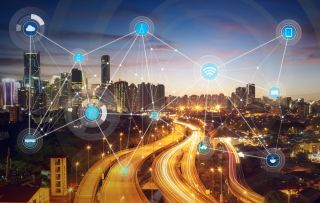 Characterised by individual devices that connect seamlessly across homes, private buildings, and public spaces, Smart Cities and Homes allow for the analysis of big data to improve overall wellbeing for everyone in the city. According to GFK, Germany’s largest market-research institute, 25% of UK households already have at least one smart home device, and 78% of consumers around the world think the idea of a smart home is a good one. Further, research firm Gartner has predicted that out of the 8.4 billion connected ‘things’ currently in use, 5.2 billion of these devices are used by consumers either directly in the home or in their day to day – 63% of the overall number of devices that make up the Internet of Things today. However, just because we can connect everything, doesn’t mean that we should. While there are those who expound the benefits of connecting every single device we come into contact with, in reality, this isn’t the best course of action. Imagine it’s 2025, and you get a call from your bank to say you’ve been a victim of online fraud. The criminals have managed to take £1,500 directly from your bank account over the course of three months before being found out. They had all your account details and password, so it looked as though you were making the transactions. You’re shocked – cybersecurity is a huge priority and you always update your phone, computer, and tablet software with the latest security firewalls. You know the difference between a genuine email and a phishing scam, and you never disclose your passwords. Then the bank manager asks, “what about your smart fridge?”. You might laugh, but they’re not joking. It’s 2025 after all, and everyone in your neighbourhood, including you, has a connected home. Your fridge is connected to the internet via super-fast Wi-Fi, as are your lightbulbs, boiler, coffee machine and even your car. Yet while this Wi-Fi is incredibly fast, it isn’t the most secure and it’s likely that the fraudsters have gained access to your personal information through hacking the smart fridge’s Wi-Fi connection. While this is a fictional story, it’s a very tangible possibility that could arise in the coming years. Before we connect everything to a single network in our homes, we need to take a step back and consider whether we actually need every single device to be connected. Will having smart lightbulbs really improve our personal day to day life or will it disrupt other elements in the home? Everything we connect in our homes and across our cities needs to have real purpose and provide genuine improvements – not just be a fad we get for Christmas. One of the most important things the above example demonstrates is that when adding another IoT-device to the home we must consider whether it will compromise security. The security requirements of an IoT system are incredibly complex. Not only do they require the basic levels of cybersecurity needed for single systems, such as confidentiality and integrity, they also need to address authentication, authorization, data protection, nonrepudiation and both forward and backward secrecy. This heightened level of security is simply due to the number of ways an IoT system can be attacked – from targeting the physical hardware to network, software and even encryption attacks. Understandably, protecting our homes is of utmost importance, and this has been reflected in the rise of smart security devices entering our homes. To ensure these devices are able to do their job properly, alerting homeowners to when unwanted intruders have entered or when suspicious activity is occurring, they must be connected to separate networks from the everyday connected devices like fridges and lightbulbs. This will ensure that it is much harder for criminals to take advantage of vulnerable networks and hack into such devices, compromising home security. An essential element when choosing to implement a home security device, or any connected device, is to ensure the manufacturer has observed the highest level of security standards. The US has announced plans to introduce an ‘Internet of Things Cyber Security Improvement Act’ which aims to prohibit the production of IoT devices that don’t allow for software security updates and changes to passwords. Having separate secure networks for the most important devices in the home, such as home security systems, will reduce the chance of hackers being able to take advantage of weak Wi-Fi and protect not only your home security but also the security of personal information stored online. While in the coming years it will be tempting to integrate any and all smart devices into our IoT systems both in the home and across our cities, we should do so with care. Putting purpose before pleasure and thinking carefully before jumping on the bandwagon will be incredibly important when deciding which devices we connect within our homes and cities. As we move towards an ever more connected and internet-driven world, we need to ensure that we are doing so with our eyes wide open, thinking carefully about the kind of society we want to create. As the age old adage goes, just because you can do something, doesn’t mean that you should.